This is something we see all the time in our painting conservation laboratory; someone accidentally pokes the 19th century painting on canvas with very little effort and causes a hole or rip. Sometimes its amazing how fragile these paintings are. Oil paintings on canvas from the 1800’s are very brittle… more brittle that any other period of art. This is because the additives into the fabric in order for them to be produced by industrial looms accelerates the deterioration by acids. I have in the lab canvas that is 200 years older that is 10 times stronger because it was made without the additives for mass production. 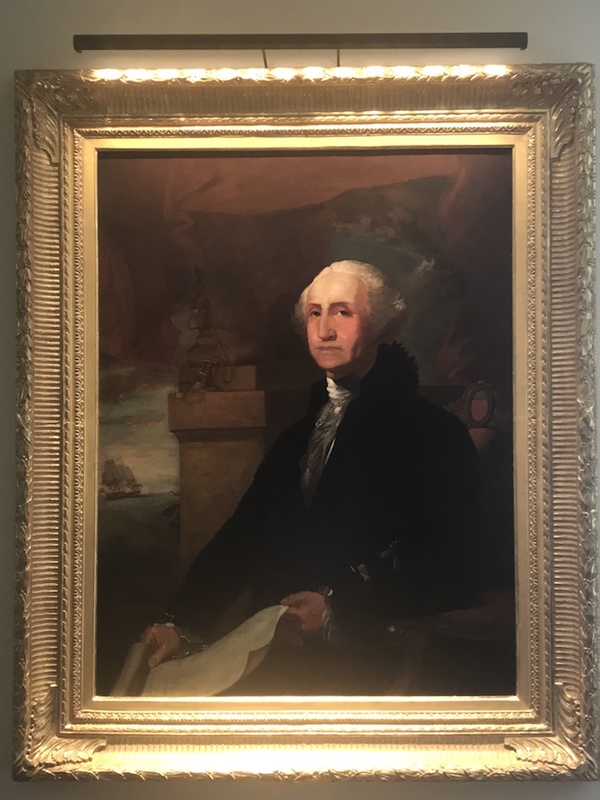 In the case of this “White House Quality” historical portrait of George Washington that was painted about 1800, the hanging wire which was a bit frayed, poked the art handler as it was being hung, the person reacted and accidentally hit against the portrait putting his elbow through the painting. We are often asked if we can cut costs by patching the rip. This option most always creates negative condition problems, sometime immediately and sometimes “down the road.” The patch sets up an uneven reaction of the canvas from humidity and heat setting into motion new cracking patterns and causing very often disfiguring bulges. In addition, the later removal of the patch can be problematic depending on how “permanent” the repairer meant it to be (it may be very hard to remove). In other words, you will be creating preservation problems almost immediately. The distortion caused by patching a rip in an oil painting. Many smaller rips can be repaired very nicely without a general lining and can even be made to be minimally visible from the back. 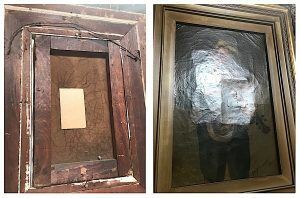 If you buy a painting with a patch and you want to properly preserve and restore the artwork, then you will have to pay for the removal of the previous repair person’s sins in addition to redoing it correctly. The gloss of the final result must be exactly like the surrounding areas. This entry was posted in In Lab, Painting on canvas, Travel and tagged rip repair testimonial. Bookmark the permalink. Thanks Kabirat for the nice comment. This painting of George Washington is just beautiful. I love this period of painting and I’m impressed with the quality of work the painter did. Great job on its restoration. I have a couple of 19th century paintings that I guess are brittle too. Once has a rip. Your story and video was very informative. I’ll call and see what can be done to salvage them.